As often happens on the Internet, these claims have been copied and echoed elsewhere. I was, though, surprised to find them in “art historian Michael Bird’s series An Alternative History of Art in 20 Media” on Christie’s website, dated July 2015. I think if that is the alternative, I will stick with something more accurate, thank you. And as for this being propagated by Christie’s! So was the humble paint tube really the decisive factor in Impressionism? Of course not. Hurt has rolled together a series of half-facts taken out of their historical context, and arrived at completely the wrong conclusions. America’s largest organisation devoted to “the increase and diffusion of knowledge” has left this manifestly incorrect article on its website for more than two years, allowing others too slipshod to check its claims to parrot its errors elsewhere. Allow me to correct Perry Hurt’s and Michael Bird’s assertions. John Goffe Rand was the person who, in 1841, patented “metal rolls for paint”, as detailed in his papers held in the Archives of American Art of the Smithsonian Institution. If the word “breakthroughs” is intended to mean Impressionist style, then this sentence is claiming that that style was only possible using tubed paint: an assertion for which there is no supporting evidence, and considerable evidence against. Although broadly correct, oil paint sold in bladders remained popular long after the introduction of oil paint sold in collapsible tubes. Callen (2015, pp 70-72) has provided a detailed account, based on references to primary sources, of the use of bladders and their inclusion in portable painting outfits until well after 1841. She also points out that the primary advantage seen in tubes of paint was not their portability, but their cleanliness and lack of smell when used in the studio. If the word “finished” is intended to mean completed, then this is also manifestly incorrect, as demonstrated by the large numbers of oil paintings which were completed entirely en plein air before 1841. Among those, the best-known are probably those of Corot, but Galassi (1991), Conisbee et al. (1996), and Clarke (2015) document carefully the established tradition of plein air painting which preceded both the French Impressionists and the invention of the paint tube. Update: while I was researching another series of articles, I stumbled across this glaringly incorrect opening sentence, in the Wikipedia entry for Eugène Boudin: “Eugène Louis Boudin (French: [budɛ̃]; 12 July 1824 – 8 August 1898) was one of the first French landscape painters to paint outdoors.” So we have another completely false attribution, incorrect by a mere century or so. 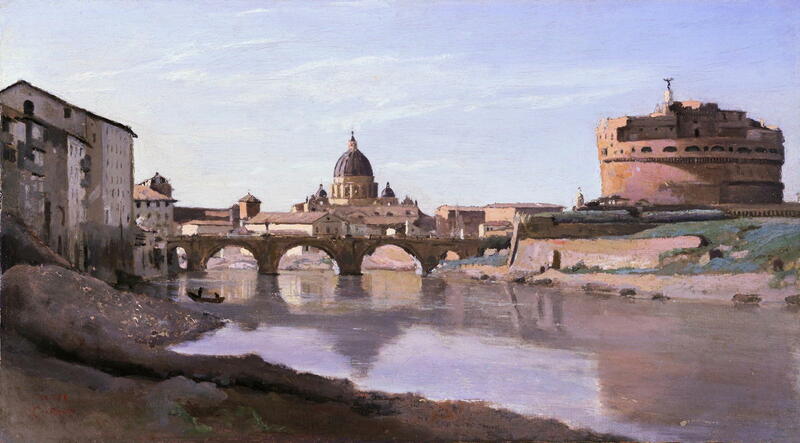 Jean-Baptiste-Camille Corot, View of Rome: The Bridge and Castel Sant’Angelo with the Cupola of St. Peter’s (1826-7), oil on paper on canvas, 26.7 x 43.2 cm, Fine Arts Museums of San Francisco. WikiArt. It is both an urban myth that the French Impressionists invented plein air painting in oils, and equally fallacious that it is not possible to paint en plein air in oils without using tubed paints (see also Callen, 2015, pp 64 ff). 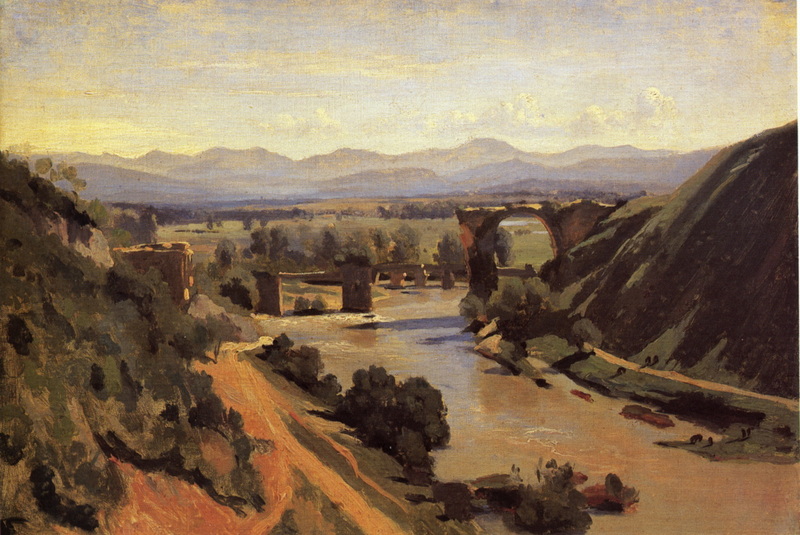 Jean-Baptiste-Camille Corot, The Bridge at Narni (1826), oil on paper, 34 x 48 cm, Musée du Louvre, Paris. WikiArt. Oil paints became widely used during the Renaissance precisely because they are slow to dry (taking 2-14 days), unlike other media such as egg tempera and watercolour (taking just a few minutes). Back in the days of the Old Masters, it is true that painters, their assistants, or apprentices within a workshop would prepare fresh oil paints for a painting session. By the early nineteenth century, such practice was becoming increasingly uncommon, and even established and reputable artists such as Delacroix purchased prepared oil paint in bladders (rather than tubes, which continued to be significantly more expensive than bladders – see Callen, 2015, pp 70-72). Callen (2015, pp 257 ff) has discussed the choice and use of colours, particularly when painting en plein air, and demonstrates that the major limitation to the number of colours used in oil palettes when working plein air was and is not the container used for paint (bladder v tube), but the area of the palette surface. Palette surfaces used in the studio were and are considerably larger, and enable the painter to have more than ten colours in use; those carried out for use en plein air and then held in the hand could seldom carry more than eight colours. As Callen (2015, p 259) writes: “In reality, what the Impressionist ‘spectral’ palette represents above all is continuity with earlier landscapists rather than complete transformation.” Those earlier landscape painters were, of course, the Barbizon School, whose novel palettes preceded the introduction of paint tubes. It is strange to assert that a painter in oils “would fill in just one area of a canvas at a time”, as there was and remains great variation in technique, according to the location and method of painting, and the painting being worked on. When painting en plein air, it was never the case that only the sky or another discrete area of the painting would be ‘filled in’ in a single session, as described. synthetic ultramarine blue, from 1828. Several of these were discovered (not “invented”) during the eighteenth and not the nineteenth century. Chrome yellow was introduced as a pigment in artist’s oil paints in 1804, quickly became very popular, and is known to have been used by John Constable in about 1836. Emerald green succeeded Scheele’s green in about 1800, the latter having been introduced in 1778. It is known to have been used by John Constable in about 1836, and extensively by JMW Turner prior to 1841. 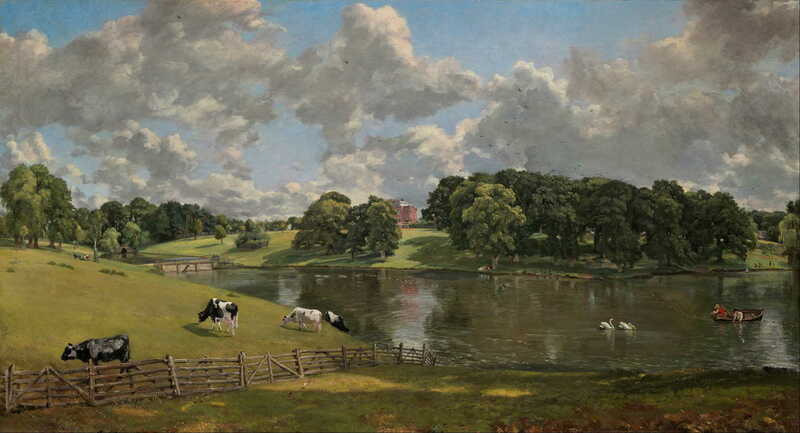 John Constable, Wivenhoe Park, Essex (1816), oil on canvas, 56.1 x 101.2 cm, The National Gallery of Art, Washington, DC. Wikimedia Commons. The only significant new group of pigments which were used in some Impressionist paintings, and then only commonly after 1890, were cadmium reds, yellows, and oranges. Chromium-based greens, zinc white, and cerulean blue were introduced after the arrival of the paint tube, but their use was in no way dependent on tubes. Callen (2015, pp 263 ff) also considers changing availability of pigments and their use. No one would deny that tube oil paints became a great advantage to the French Impressionists, and that they did facilitate plein air painting in oils. However to assert that without paints in tubes Impressionism could not have happened is not mere hyperbole, but patent nonsense. Conisbee P, Faunce S and Strick J (1996) In the Light of Italy. Corot and Early Open-Air Painting, Yale UP. ISBN 978 0 300 067941. Galassi P (1991) Corot in Italy. Open-Air Painting and the Classical-Landscape Tradition, Yale UP. ISBN 978 0 300 049572. Thanks to the fine folk at QoR for drawing my attention to this. Posted in General, Painting, Technology and tagged history of painting, Impressionism, oil paint, oil painting, painting, pigments, technique, tubes. Bookmark the permalink. Updated 2 January 2016 to add the glaring error in Wikipedia. I hate to say it, but…oops, there goes another straw man. Also, RCIF (e.g., “finished” probably means something other than it would alone, without the marks).